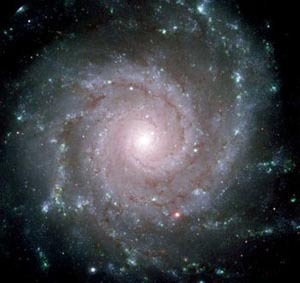 Practiced stargazers sometimes use three stars of the constellation Aries the Ram to find an elusive galaxy – M74 – also known as the Phantom galaxy. As seen from the world this evening, the first quarter moon shines in front of the constellation Pisces the Fishes, not far at the Aries/Pisces border. The three stars mentioned above are to the moon’s upper left tonight. They depict the head of Aries the Ram. In their order of brightness, these stars are Hamal, Sheratan and Mesarthim. The star Eta Piscium in Pisces may be hard to see tonight because of the moonlit glare, but this star is fairly easy to pick out on a dark, moonless night. 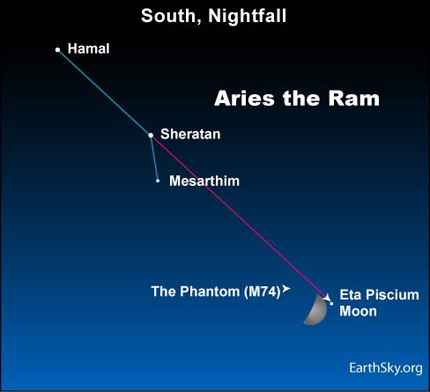 Practiced stargazers often starhop to M74 (the Phantom galaxy), using the three Aries’ stars and Eta Piscium. You might be able to spot the star Eta Piscium with binoculars tonight. Will you see M74? No way! Of the more than 100 Messier deep-sky objects cataloged by the famous comet hunter, Charles Messier, this galaxy is one of the hardest to see in a telescope. Therefore, you don’t really need a super high-powered telescope to see the Phantom galaxy, but you do need a perfectly dark and transparent sky. Every March, when it is technically possible (though difficult) to spot all the Messier objects in one night, M74 is one that is commonly missed. Site contents copyright © 2019 Recorder Online	except as noted. All rights reserved. | 88 queries in 2.110 seconds.